I'm giving away one sandwich box, 2 packs of picks, 1 pack of silicon lace barans, 1 pack of plastic barans, 1 cutter, 1 pack of silicon food cups and 1 pack of assorted deco picks. Please note that I will be removing the packaging for the silicon food cups so that it is easier to pack, do not join this giveaway if you are not ok with it. A closer look at the pack of assorted deco picks. To enter this giveaway, please log in your email or Facebook account via the Rafflecopter widget below and follow the instructions there. (Please email me at bentomonsters@gmail.com should you have problem using it. Increase your chance of winning by following my account on Twitter, and sharing this giveaway on Twitter, facebook and/or your blog. Invalid links and entries will be disqualified. Giveaway is open internationally. Giveaway will close on next Monday, 21st January 2013. The winner will be picked randomly and it will be announced on next Tuesday, 22nd January 2013. Please check back this post for the winner then. The winner has 48 hours to respond to my email, after which I will proceed to pick a new winner. Good Luck! what an awesome give away thank you! It is awesome picks n tolls! Congratulations on your new milestone achieved! Great stuff you have up there, will surely try my luck. 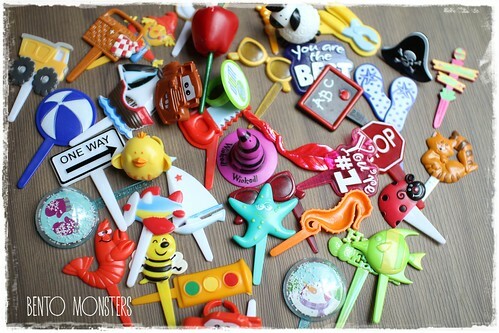 Can u pls let me know where did u get those cute picks/deco from? At least if I don't win I can still buy them, LOL. Thanks in advance. Tk u!! The picks were fr 100yen store in Tokyo. The deco picks were from all over, eBay, BentoUSA and some from my bento friends in US who bought them from baking supplies shops. Maybe you can try and see whether your baking supplies stores carry them because they are actually cupcake toppers. Thanks for the giveaways and contratulation on reaching the 4ooth posts! What a big achievement you have! Well done! I say it again: Cancel the giveaway! Give all the picks to me!! I really want to win this one! It is AMAZING! Congratulations on the milestones! Your blog is awesome. What an accomplishment!! Yay to you!! This would help me get started with making my son Bento lunches. I have been wanted to do this for sometime, but do not have the tools yet. Really cut stuff. Congrats on post (almost) 400! Congratulations! What a successful blog you have going here. :) I love all of the goodies. This would be so fun to win!! Thanks! Congrats on the milestone. Thanks for hosting the giveaway! We love following all your fantastic posts and look forward to many more. Congrats on the milestone, that is so wonderful. Also thank you for hosting the giveaway. Love you site. Hello there! Congratulations on reaching 400! 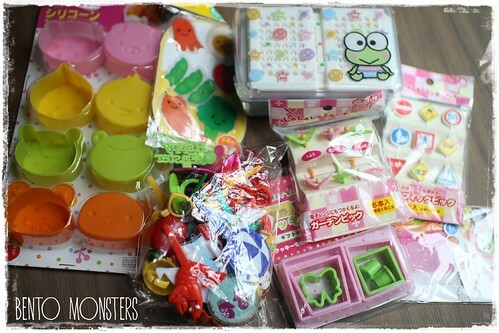 I chanced upon your site and wanted to let you know that I've included it in my post (http://www.gingerbreadmum.com/2013/01/bento-making-workshop-or-lets-empty.html) as I just attended a bento making workshop and am now raring to go! Will be popping by often :) Keep making these gorgeous bentos! Congratulations on reaching this great milestone, having reached my 100th post this week, I know what hard work that must be! Thank you for hosting such a great giveaway and for sharing all your beautiful lunches with us all! Your site is adorable! Every time I visit, I think I stare at your banner picture for ages because I love it so much. 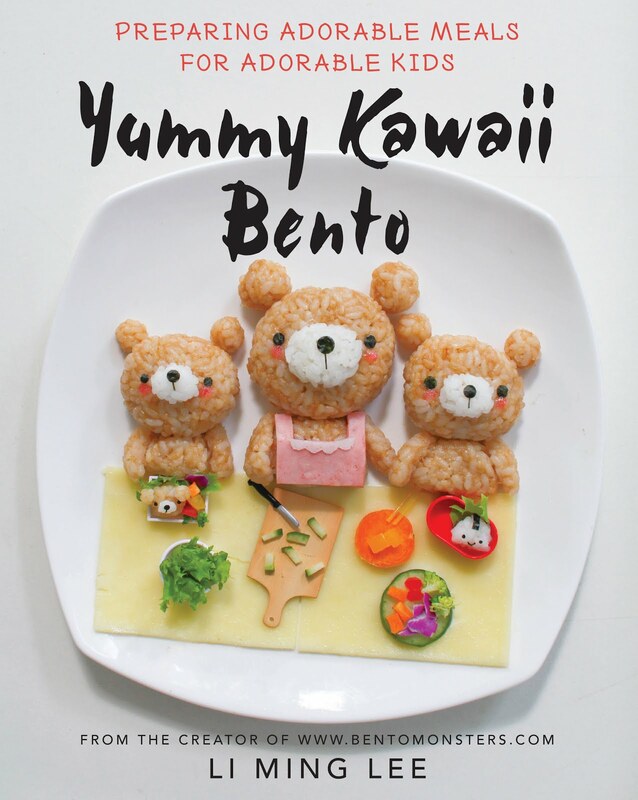 It perfectly suits the mood of bento! Congrats! Oh wow, a great prize. Congratulations on reaching 2 great milestones. Great giveaway! Your blog is awesome. Thanks for sharing all of your great bentos with us! Such a great blog! I just started making bento boxes for my daughter. It has been so much fun and she can't wait to see what she has in her lunch box each day! Thank you. This GiveAway is so awsome!!! !